The hardtracking staff’s kissin’ cousins at Campaign Outsider have written extensively about Rick Berman, the corporate gunsel who sets up stealth non-profit groups to front for the liquor, fast-food, tobacco, and restaurant industries. Oh, yes – and for any companies that oppose unionization of their employees. 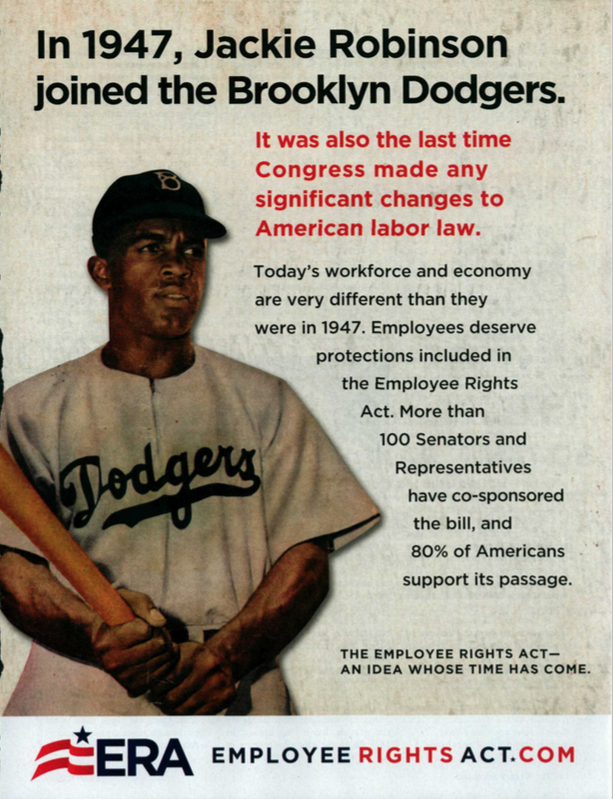 Those latter activities fall under the umbrella of the Center for Union Facts, which has been running this ad in the latest issues of the Weekly Standard. This entry was posted in Uncategorized and tagged Berman Exposed, Campaign Outsider, Center for Union Facts, Center for Union Whatever, Employee Rights Act, Getty Images, Jackie Robinson, Rick Berman, Sneak ADtack, The Weekly Standard. Bookmark the permalink.